Here’s a unique way of making tacos that’s fun, different and delicious. There are no tortillas allowed for these tacos. Instead of tortillas, these tacos are made with pockets. Pita pockets that is. All you have to do is fill your pockets up with taco fixings for a quick and easy meal. No frying and no fuss. 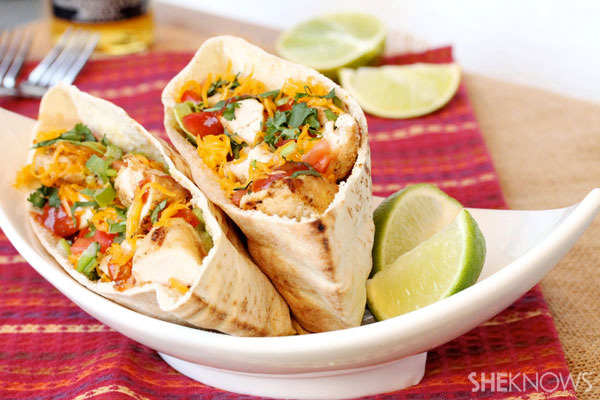 It’s as light as eating a salad yet full of delicious taco flavor in a soft pita shell. Cut the chicken breasts in large pieces (about 5 pieces for each breast). Heat a nonstick medium skillet on medium heat and add the pieces of chicken, ground pepper, garlic powder, onion powder, cumin powder and salt. Stir all ingredients together (no need to use oil if using a nonstick skillet). Stir the chicken as it cooks so that it doesn’t brown too much on any one side. Continue stirring the chicken until it’s thoroughly cooked (about 5 to 7 minutes total). Set aside. Carefully open each pita half. Set on a cooking tray and warm in a preheated oven for about 4 minutes or until warm. Add the lettuce in the bottom of the pita pocket. Then add the pieces of chicken and the cheese. Top with the tomato, green onion, cilantro and salsa. Serve with 2 quartered limes per serving.